It's a blast facing, I'm sure you will enjoy it and don't worry about comparing to anyone else's. Like many wise people have stated on this thread already that every face, from simple to extravagant, made with love has a place here on facer. Thank you so much for your kind words, I'm very greatful that you enjoy my work. I hope my faces make you smile when you check your watch. It is really hard to get (demographics) statistics from Facer. However I compared some of my "duo' watch faces (for woman & for man), released at the same day. If I compare the most relevant then I get a pretty nice distribution 70 : 30. I believe this is close to the overall woman vs man "relationship" here at Facer with growing "woman part" as @Facer_Official mentioned ones. 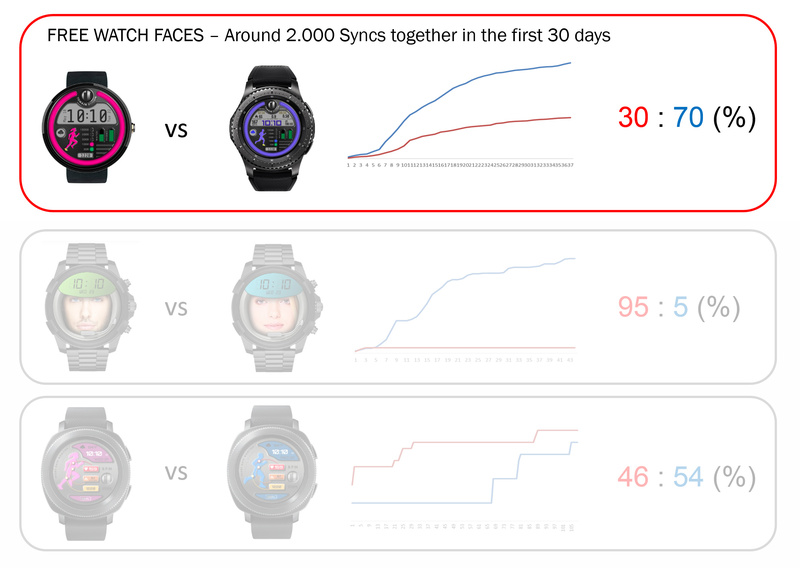 Last two comparisons shows different results, but they are paid watch faces with much less syncs. I have no design ability at all. I know a good watch face but can not make them. You will find that there are some very talented designers on this site. Besides being so talented they are also very helpful, very friendly and all around good people from all walks if life. They will do all they can to help with your questions or problems you have. And alot of times they will go above and beyond with their help. I've used other watchface sites and none of them compare to the quality of the product or the quality of the people on facer. So we all should give thanks to all these premium (and soon to be premium designers: @roycaruso, @Tomas, @phantasico, @syntaxracing, @Linlay, @Mellin and the many many more. We ask, he responded, thanks for the data @Tomas! I already commented on the actual post, but man, well done on this latest design @roycaruso!! 10/10! Love the beating heart effect Fantastic work @roycaruso!! Maybe haha, I don't think so though - I think everyone has different tastes and you're just adding to what makes individuality great I'm sure there are men who like the pink one more too! However, if community involvement is an indicator, it does seem that far more males use Facer than females (or are more active in their use at least).